French style ca. 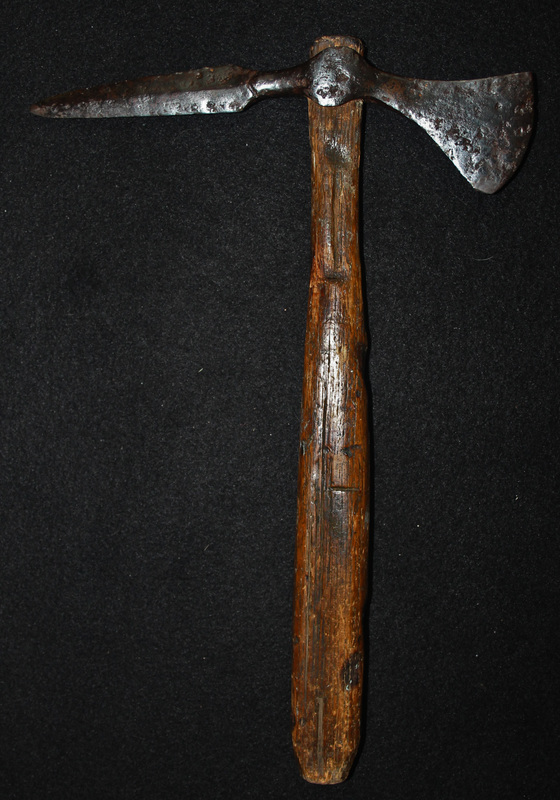 1730-1760's dagger blade spike tomahawk with period ash haft. Notice all the deep random burns on the haft-- likely from hot coals around the campfire. The head is remarkably thin & light. 8" X 11 3/4" & less than 1/2 lb. overall weight. What is most interesting is what disturbance caused the hot coals to be scattered & the tomahawk to be left laying on them? This style is extremely rare to have survived intact. It has three or four fairly deep perpendicular cut marks on both sides of the haft the size a sword or large knife would leave. Historic records recount stories where sword, knife and bayonet blows were blocked with tomahawks or visa versa. It was certainly light enough to easily carry thru the remote woodlands without a horse, up & down the valleys, peaks, across rivers, lakes & battle sites. If only it could talk. 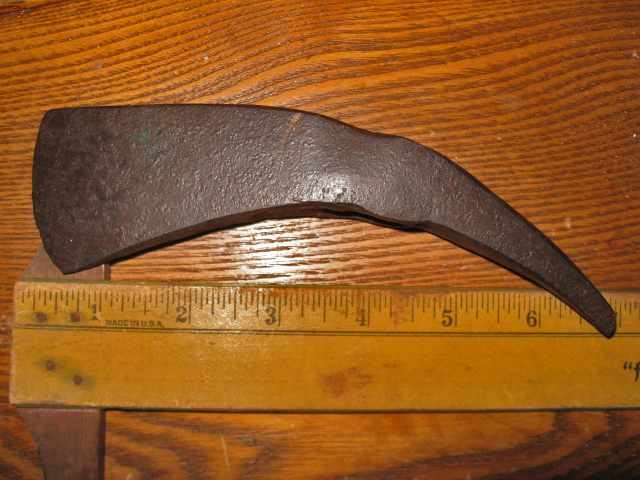 This crudely shaped spike tomahawk likely came from a local American or Canadian blacksmith. This one came out of a PA estate with part of the haft still inside the eye. Often blacksmiths would be assigned by the government to provide services for tribes as part of a treaty agreement. 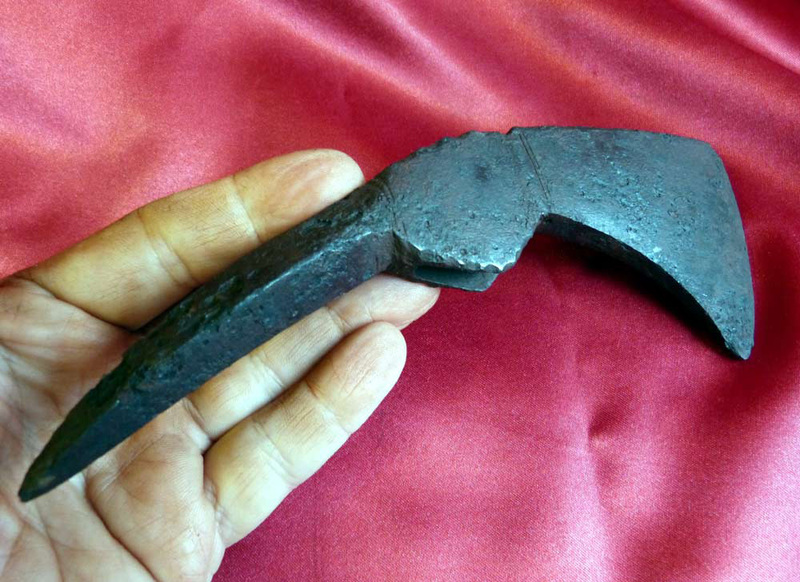 Also there were many free trader entrepreneurs (legal & illegal)who took their blacksmithing skills to the frontier where it was so much in demand. 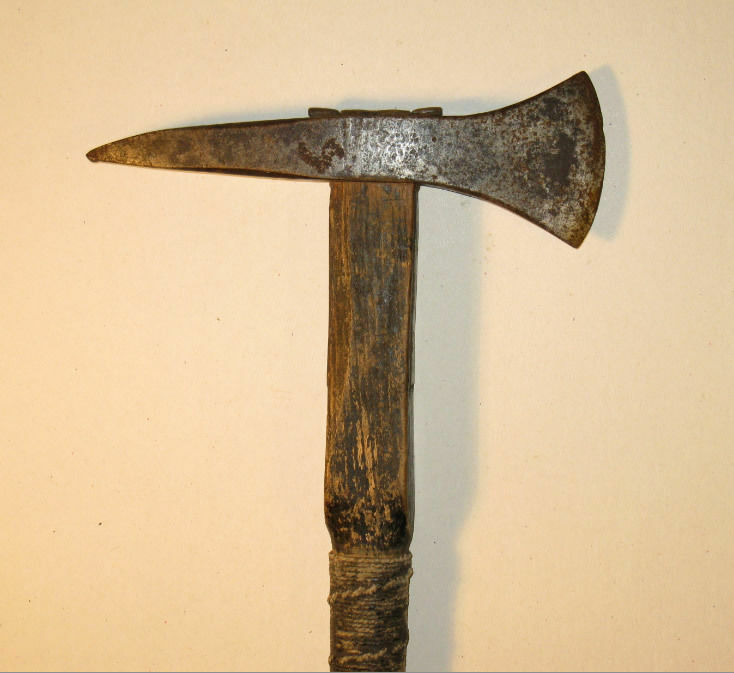 The double ears feature seemed to be a trait particularly common in the 18th C.
Ottawa 18th C. spike tomahawk dug by Robert Bennett in NW lower Michigan. FRENCH. 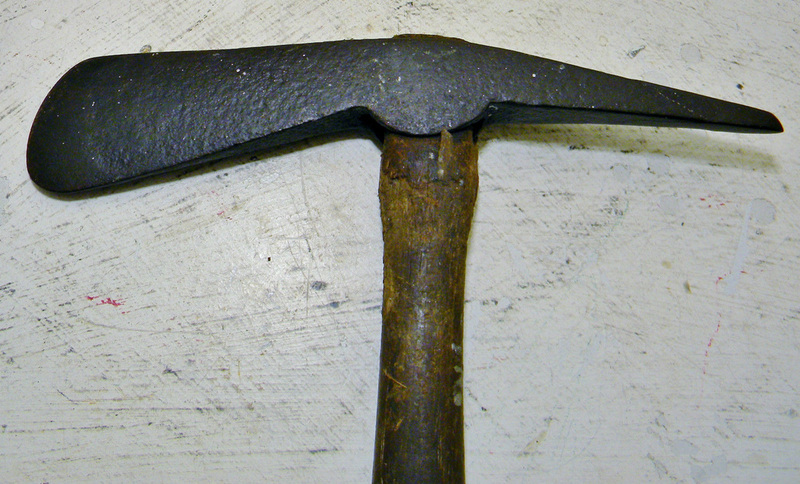 The diamond cross section spike is reminiscent of early French boarding axes. 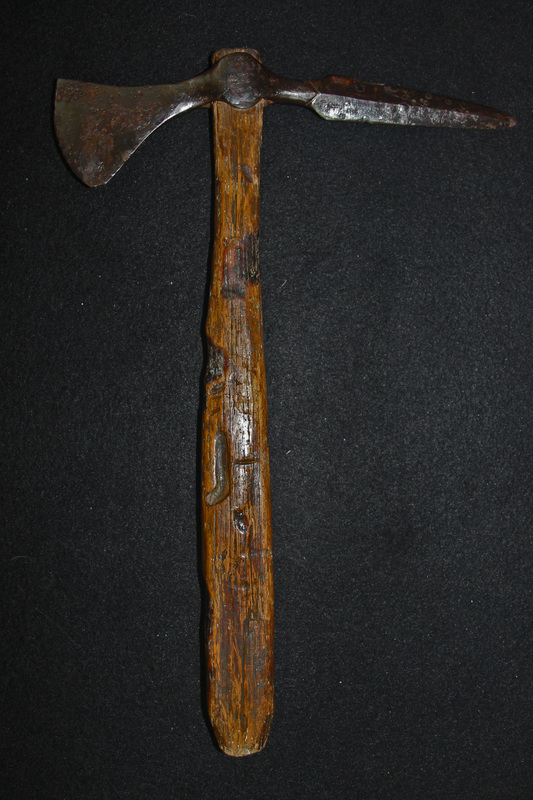 Spontoon tomahawk closely related to the spike tomahawk. Mee-nah-tsee-us White Swan Apsáalooke Crow ca. 1851 to 1904 owned this. 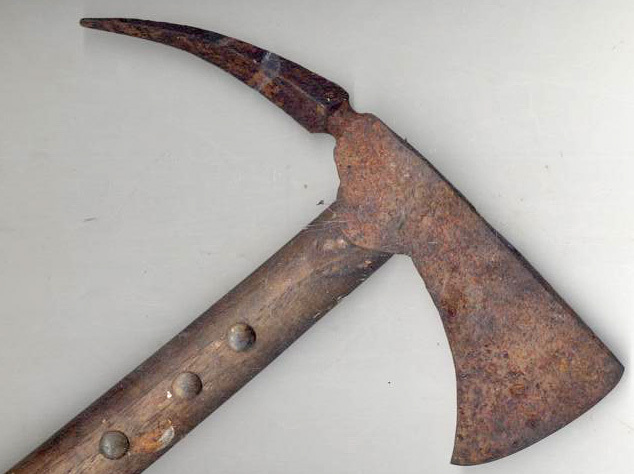 The Dolley family had found a corroding iron flat-spiked tomahawk-head, supposedly somewhere on Panther Run (aka Panther River) in the lakes region of Maine. 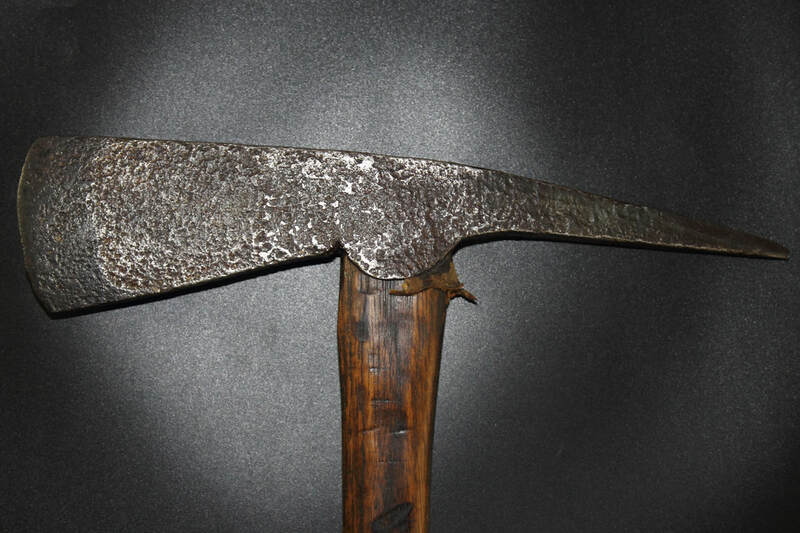 This authentic triangular flat leaf shaped spike type tomahawk is rare although there are many reproductions that have been produced since the 1950's. 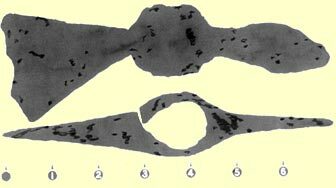 Although this image is just a surface scan of it, the shape is clear. 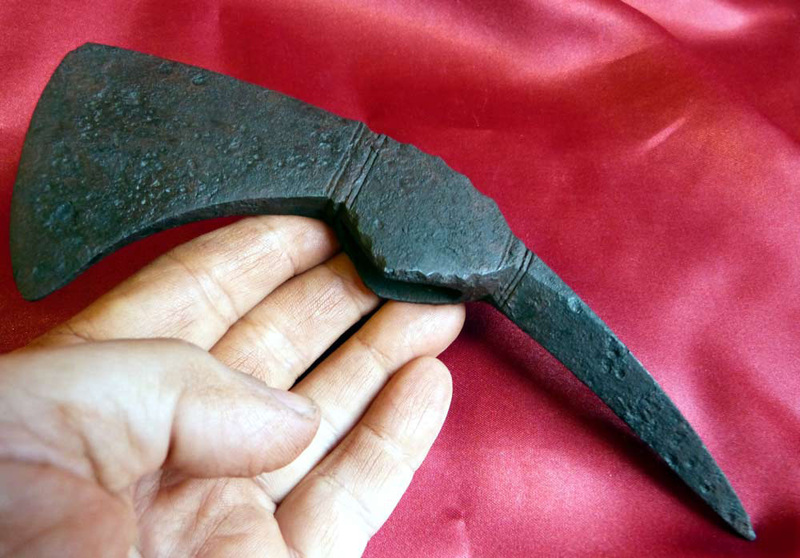 This kind of leaf shaped spike is rare but authentic examples do exist. 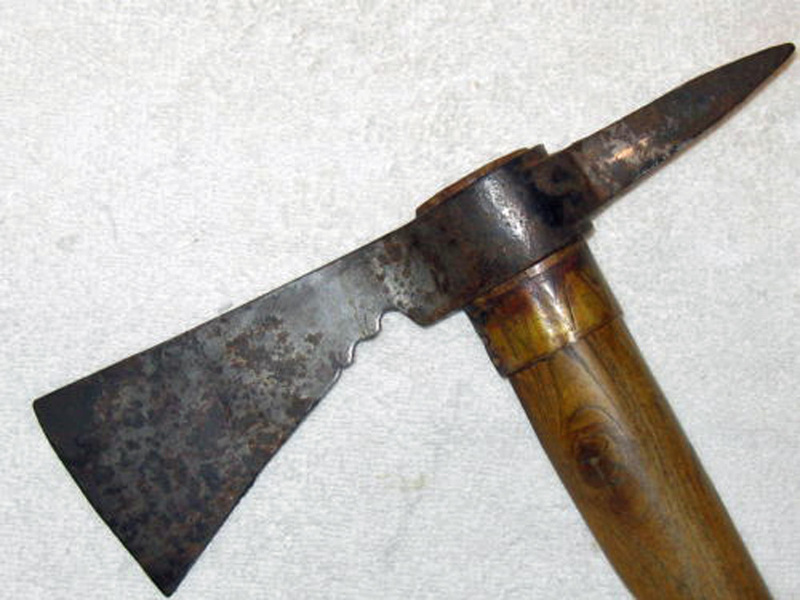 In Baldwin's 'Indian War Clubs of the American Frontier' a tomahawk excavated from a burial shows a regular trade axe with a leaf shaped spike added to it. Also there is an example in 'Swords and Blades of the American Revolution' by George Neuman. 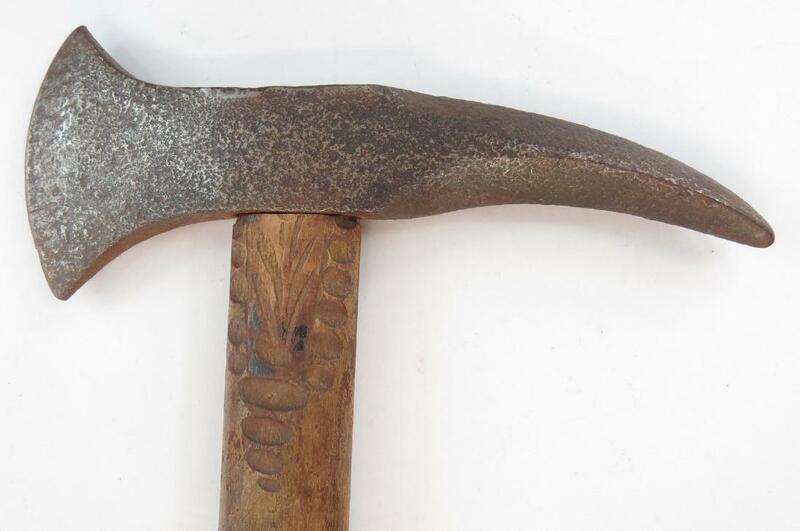 At the bottom of this picture is another leaf shaped spike tomahawk from 18th C. --ex Dressler collection. he had been present at the action with our gunboats. 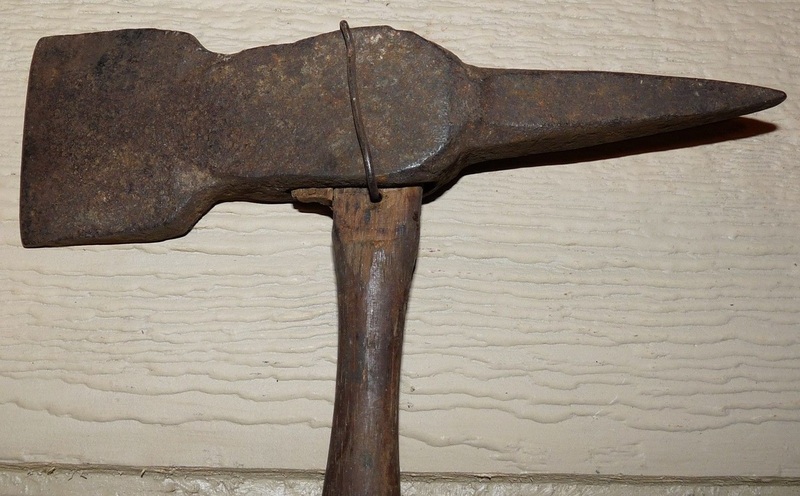 As on many of these, the eye appears to have been first drilled or punched out and then successively larger punches with the taper widening at the top so the handle does not fly off once wedged. This arced style makes for a natural swing. This Eastern style goes back at least as far as the mid 18th C. although I wound not be surprised if they used them much earlier. Another arced style 5 1/4" long. with blade & spike blunted during the period. Here is a ca. 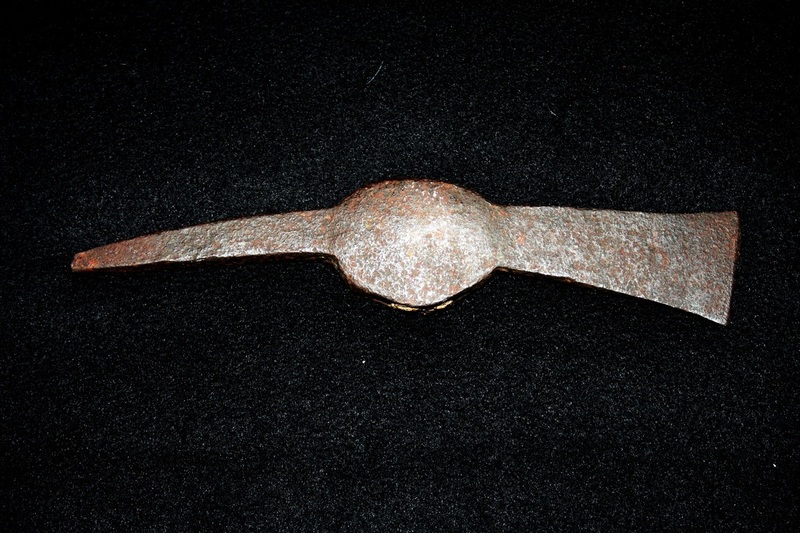 mid 18th C. one reportedly found near Ft. Ticondiroga over 9" long that has very clearly visible steeled blade & steeled spike. Steel was more costly to make at this time so they used it sparingly or not at all. It has a 5 degree angle upward from the perpendicular similar to those found on British/Mohawk area sites. The haft is modern ash made by me. This one with a period ash haft which came from the Hudson River region, NY. 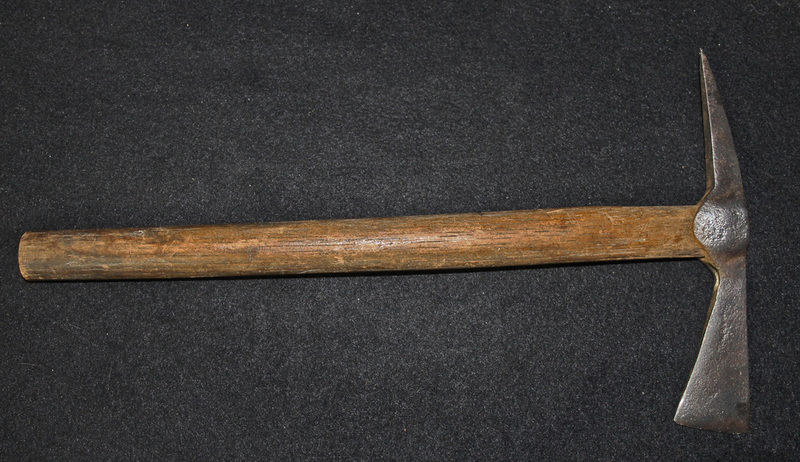 8.75" LONG SPIKE TOMAHAWK Mid to late 18TH C.
This is a very interesting and quite large spike tomahawk at 11 1/4" long which was also used on both sides as an anvil for chiseling (~21 chisel marks), probably arrowheads from scrap metal. 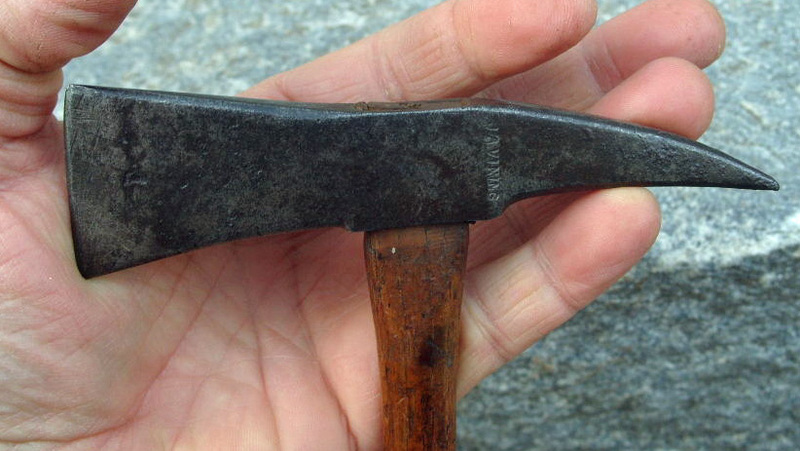 Perhaps 1% of trade axes have these marks & a far fewer percentage of spike tomahawks. The iron was case hardened where the outside was hardened while leaving the inside softer so it bent the spike & blade a bit. 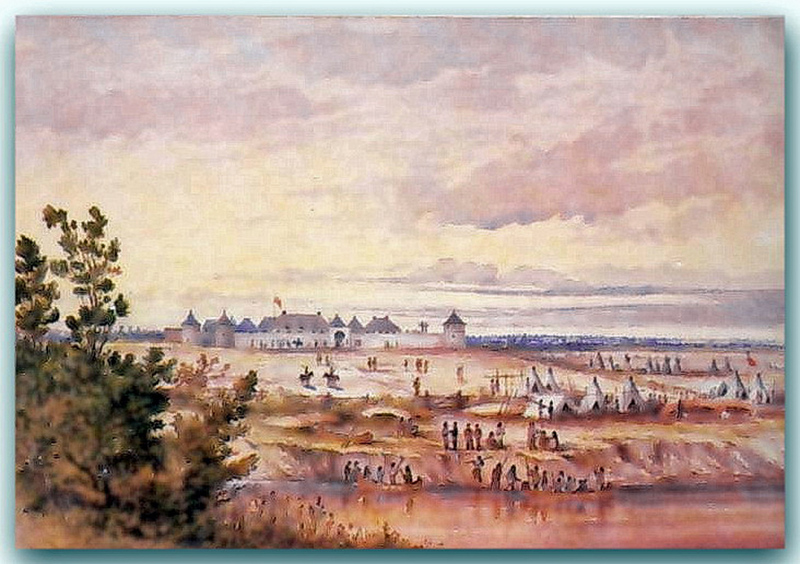 20" X 7.5". This is a ca. 1920's tourist/Rez. 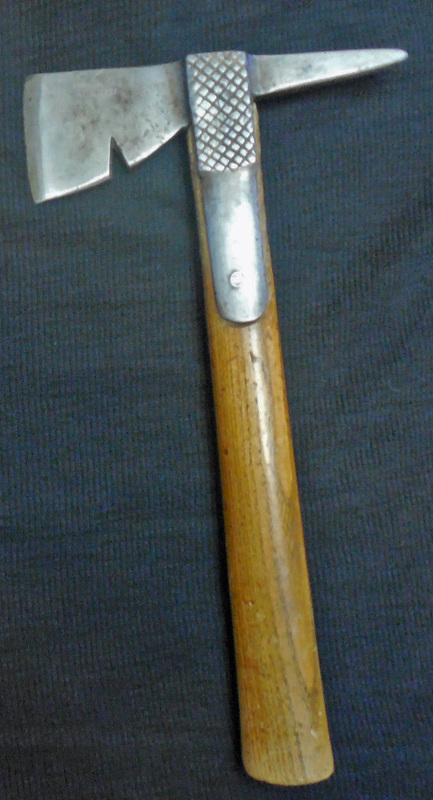 spike tomahawk, maple sapling haft, with brass escutcheon pins (brass pins were available from mid 1870's on), with an early style square barbed wire holding it on Gliddon patent 1874. Head is cast iron that was then sanded smooth. The twisted shaft shows lots of handling & was formed by a vine twisting around the sapling while it was growing. 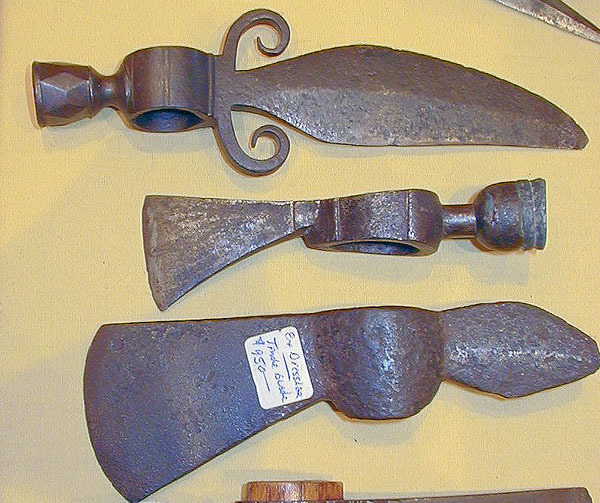 There were many places selling Indian made tourist items throughout the West during the early 20th C. There were also over 200 different Wild West shows that came and went during the early 20th C.
﻿THE FOLLOWING ARE NOT SPIKE TOMAHAWKS. 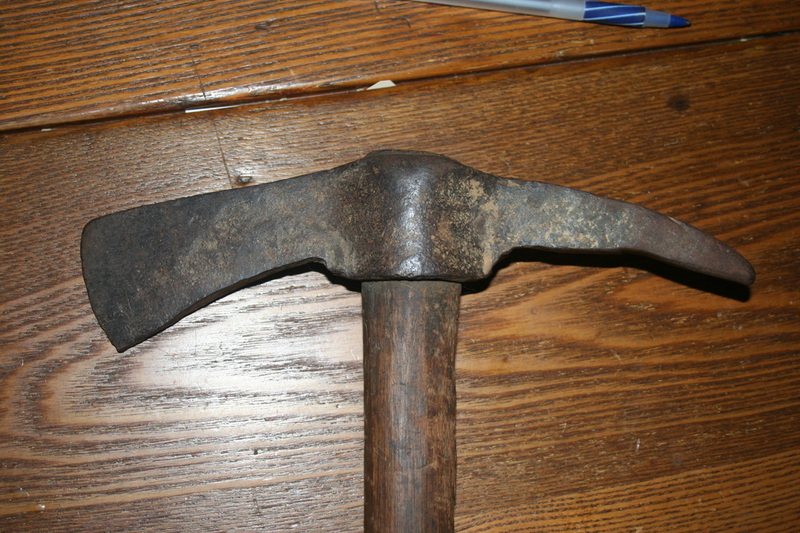 FAKE SPIKE TOMAHAWK- BY TOMMY G.
20th C. British Boy Scout spike tomahawk with patent number although there were other types. I see one for sale today of a different style with the "OA" mark for the Boy Scout's 'Order of the Arrow' (an elite subgroup that started in 1915). Remember the Boy Scouts were also in Greece, Philippines, Italy & countries you may not have considered. I imagine some were locally made one of kinds. 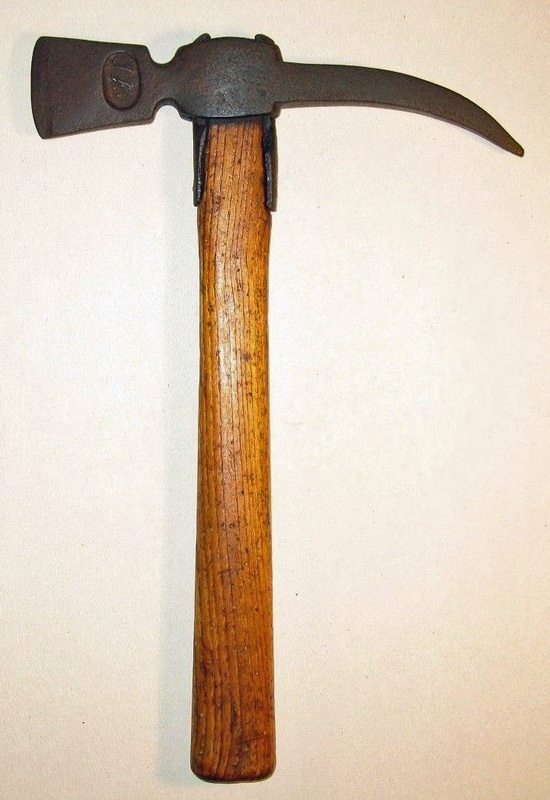 Tomahawk & hatchet throwing was popularized by the first American BSA Commissioner Dan Beard--before the insurance companies & attorneys got involved. 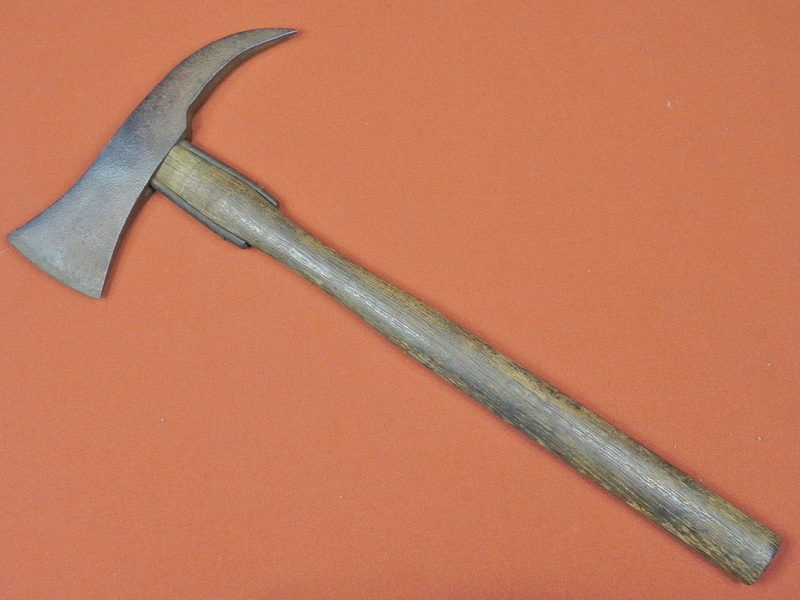 Hungarian Fokos axe with 30" handle. 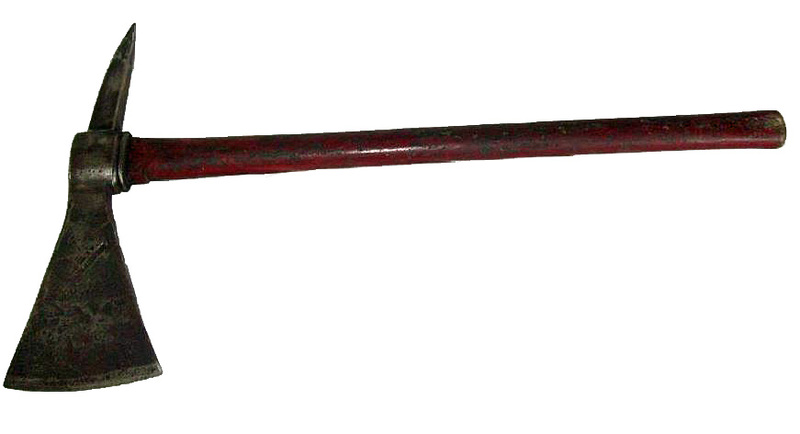 Hungarian Fokos dated 1913 on 33" handle.